For CorelDraw v.2017 only. 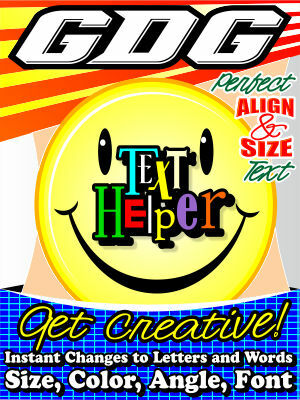 This product allows you to do some very creative things with text. There are 2 main modules. Change the alignment or size of artistic text shapes in accurately. In the instance that converting a font to curves occasionally the size will change. This part of the macro makes certain that when the item is converted to curves, it will be the size entered, o, have the perfect alignment, depending on which part of this section of the macro you need. This macro is generally a fix for poorly designed fonts, in dealing with sizing and alignment changes after converting to curve. Also in the section of the macro there is a function that can align to center the highest of lowest shape among a selection of many shapes. The second main part of the macro is where the creative fun begins. Change fonts, colors, sizes, and blends of various letters or words in your selected text string. Experiment for some interesting effects! This second part of the macro will be used more, and this macro has been brought back because of many requests for these features. Now for CorelDraw version 2017! This macro is for CorelDraw v.2017 only.